Abstract: The study of superconductor-ferromagnet interfaces has generated great interest in the last decades, leading to the observation of spin-aligned triplet supercurrents and 0–π transitions in Josephson junctions where two superconductors are separated by an itinerant ferromagnet. Recently, spin-filter Josephson junctions with ferromagnetic barriers have shown unique transport properties, when compared to standard metallic ferromagnetic junctions, due to the intrinsically nondissipative nature of the tunneling process. 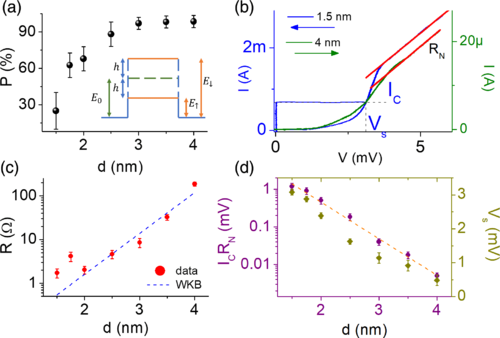 Here we present the first extensive characterization of spin polarized Josephson junctions down to 0.3 K, and the first evidence of an incomplete 0–π transition in highly spin polarized tunnel ferromagnetic junctions. Experimental data are consistent with a progressive enhancement of the magnetic activity with the increase of the barrier thickness, as neatly captured by the simplest theoretical approach including a nonuniform exchange field. For very long junctions, unconventional magnetic activity of the barrier points to the presence of spin-triplet correlations.